SCADA is an acronym for Supervisory, Control and Data Acquisition which is a supervisory system that makes it possible to observe how the states of controlled processes evolve. A SCADA system provides all the features needed to visualize information relating to actual status of various processes, manage historical data and exceptional states that go beyond the evolution of normal controlled processes. The function of the supervisory is the means to an end for any SCADA system. This function is the determining feature of a system, in the sense that a system that does not provide information in real-time or access to historical logs, cannot be defined as an automation control system. For this and throughout the last 30 years, SCADA software has grown in popularity in the market to subsequently become defined as SCADA/HMI, in as much as this software provides, as part of its nature, all the functionalities that are typical of simple visualization and user interface systems commonly known as Human Machine Interface or simply HMI . It’s clear that within this context and obvious considering that system design engineers prefer to use standard architectures by far, leaving the task of controlling process I/O to the PLC and the task of supervisory and process control to a standard PC that functions independently but is nevertheless connected to the PLC. This explains the exponential growth of ever cheaper and powerful to use PLCs and SCADA/HMI software. For the major part SCADA/HMI is still based on technology of twenty years ago when Microsoft introduced Windows XP, the COM and DCOM technology, the GDI graphics technology and Winform and despite the fact the Microsoft software technology has evolved remarkably not just with the advent of .NET, but with the new Windows 10 operating system with Windows Presentation Foundation (WPF) graphics technology and XAML as well as the growing interest for Cloud computing (such as Microsoft Azure) and the now renowned and very important technology of OPC UA. 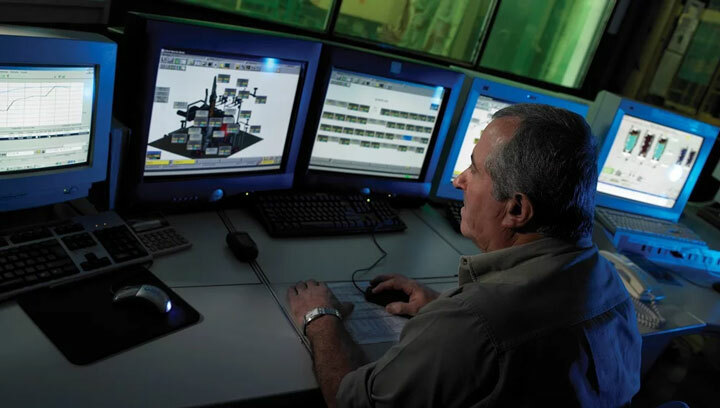 It's certainly not easy to redesign a SCADA/HMI platform considering its complexity and the use it is destined for which involves visualizing data, managing alarms and recording, controlling and analyzing data. However, it is quite evident that innovation, when pursued with strong motivation and supported by more complex technological reasons, leads to making uncompromising choices. Progea has some very clear ideas on this. The R&D team, managed by Claudio Fiorani, a founder member of the company and president of OPC Foundation Italy, is used to making uncompromising choices, used to exploring the roads leading towards innovation before anyone else, and used to researching for cutting-edge technology for passion and pride by challenging the giants of world automation up front. This is the Movicon.NExT project explained in a nutshell. Progea had to make a very difficult choice in 2013. They needed to plan the company’s technological evolution in order to deal with the challenges that the future had in store for the world of technology. Were they to evolve the current Movicon 11 technology or create a new product based on new technologies that were appearing over the horizon? Innovative software technology was still in the initial stages although already well defined. Claudio Fiorani already had in mind an architecture for a modern SCADA/HMI platform with future automation orientation. The company therefore put a very ambitious strategical plan into action even though in some parts it was considered to be almost over-adventurous. 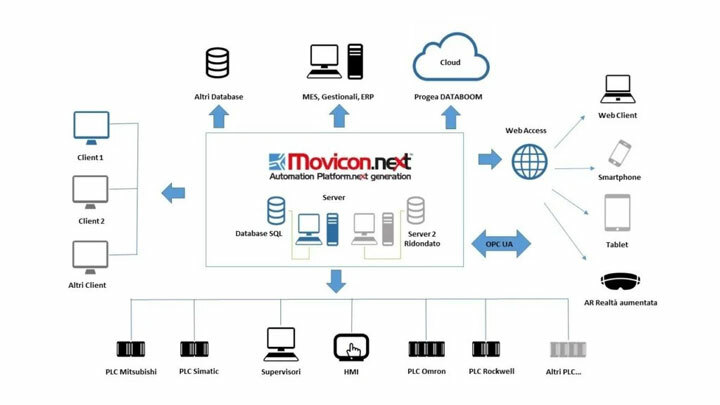 Albeit the unstable world economic situation at that time, the company had planned its future on the new Movicon.NExT SCADA platform without abandoning Movicon 11. What is the new SCADA’s added value? According to Progea, the key points are robust, scalable and modular .NET architecture, data information model, innovative management and graphics quality. They have switched over from a monolithic to a distributed architecture that offers Server and Client applications as part of .NET based on the OPC UA data information model. These key points are the essence of the platform’s architecture that, according to Progea, build the foundations to ensure today’s automation professionals the best possible technology ever for future-oriented projects.